Teach the children to save! 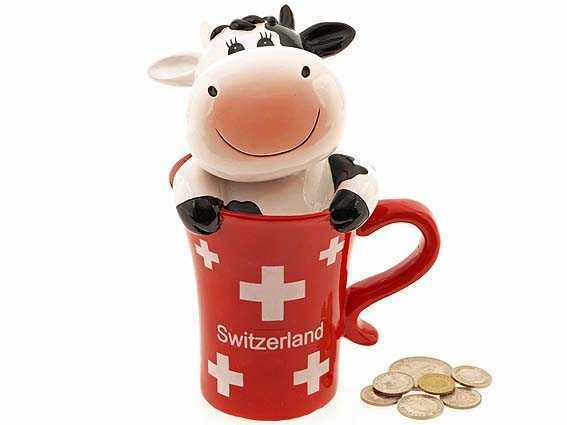 Bring back the good old tradition of saving money with a smart gift - Swiss Bank. While you can’t drink from this cup, it is easy to save some money in her tummy. Money “drop-in” opening is at the back of the cow and well protected opening on the bottom of the cup will hold all money inside. Service Area: New Glarus, Beloit, Freeport, Rockford, Sun Prairie, Machesney Park, Stoughton, Baraboo, Fort Atkinson, Monroe, Oregon WI and surrounding communities.